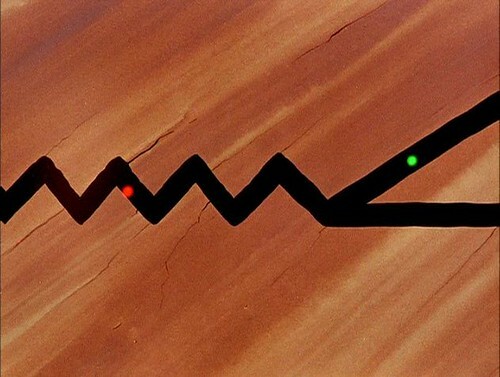 Let’s return to Beep, Beep, the Road Runner cartoon I’d examined Saturday. I want to take up a motif I’d noticed, but passed over. 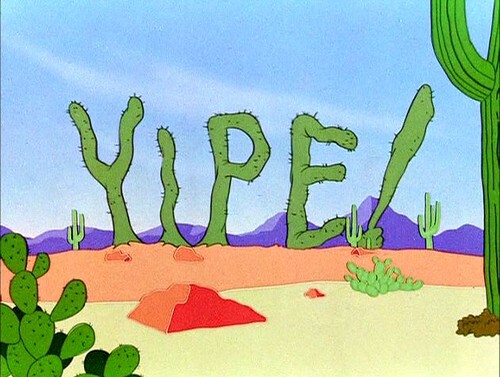 When the cactuses reseat themselves on the ground, they spell out “Yipe!” – as though they’re yelling on behalf of Coyote. It’s a good gag. But, I believe that it’s more than that. When the rocket takes off, however, it doesn’t go horizontal, it goes vertical . . .
explodes in a shower of fireworks . . .
Again, an explosion leads to writing, first by cactuses, now by burning particles. Why the writing? Yes, it makes a good gag, but why? As I argued Saturday, the Road Runner cartoons are about the distinction between human desire toward the world and the causal mechanisms operating in the world. One might even say they’re about objectivity, reason, science. 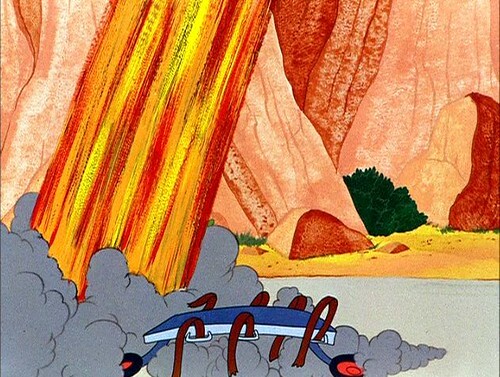 Hence every cartoon in the series opens with pseudo Latin names for Road Runner cartoons and every cartoon emphasizes Coyote’s ingenuity in constructing contraptions to catch Road Runner. He reasons things out, and tests his devices before using them. And yet they fail. Two thoughts: one old, one a bit newer. The old thought is that abstract reason starts in anthropomorphism and then, at least sometimes, proceeds to carve away the human elements until nothing is left but impersonal causal forces operating between impersonal objects. The newer thought is from evolutionary psychology, that the human brain is, above all, a social brain. The massive size increase, relative to the brains of other primates, is to accommodate the needs of a richer and more complex social life. As a corollary to the second thought, the newer one, let us posit that the neural machinery for dealing with social life is the richest and most versatile neural machinery we’ve got. 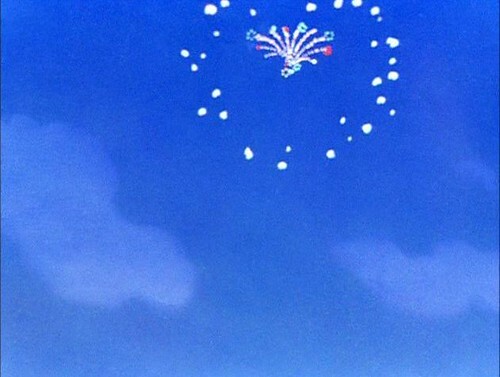 Thus, we’re going to use it to think about our most difficult problems, even when they are not problems of social life. That leads us to the first thought, the older one. Abstract reason begins in anthropomorphism because that’s how it gains access to our most sophisticated computational machinery. To use Mark Changizi’s term, the social brain has been harnessed by reason and, in particular, by scientific and technical reason. 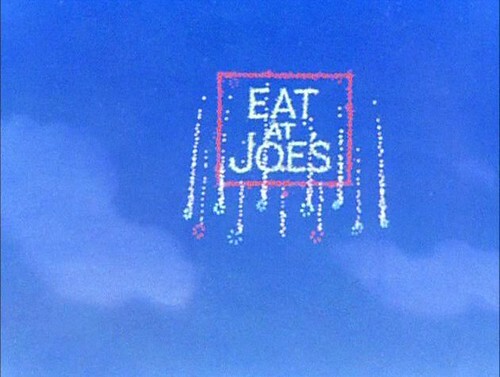 And that’s what’s going on when the cactuses come down spelling “Yikes!” and the fireworks enjoin us to “Eat at Joe’s”. The social brain is peeking through, using a medium natural to it, language. 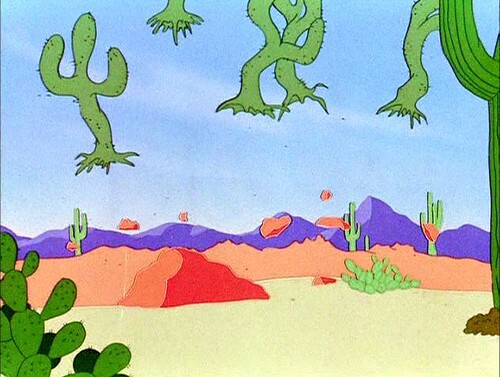 There is in fact almost no social interaction in Road Runner cartoons. 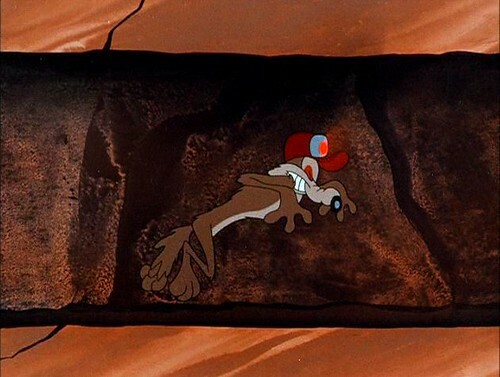 We have only two characters and their only face-to-face interaction comes when Road Runner taunts Coyote. Thus the social brains of the audience can be given almost entirely to the parody of scientific reasoning that is the substance of these cartoons. That parody, however, DOES make and preserve a crucial distinction, as I argued in my earlier post. 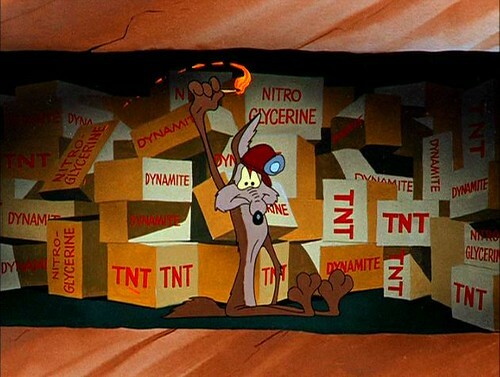 Wile E. Coyote’s desire to convert Road Runner into food has no effect on the causal interactions exhibited by his devices, schemes, and contraptions. Instead of regulating the interaction between two or more actors, ego (that is, itself) and one or more alters, the social brain is regulating the interaction between desire and causality. Yet it’s still a conversation, and, as such, requires a conversational space. As Mike Barrier points out in his commentary (in Vol. 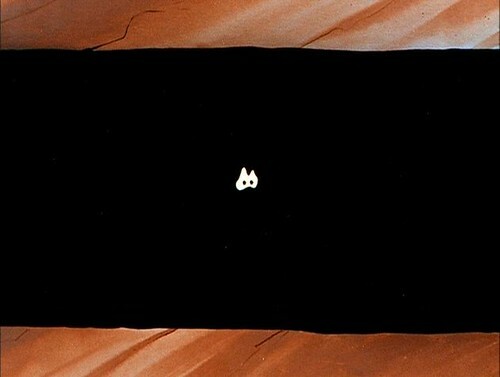 2 of the Looney Tunes Golden Collection), we, the audience, enter the cartoon looking over Wile E. Coyote’s shoulder; he plays to us and thus draws us in, on his side. At the same time we’re aware of things Wile is not. We’re the ones who see “Yikes!” and “Eat at Joe’s”. We’re the ones who exercise the distinction between desire and causality. We’re the ones who learn that, no matter how ingenious it is, no matter how fast it can move, desire can never overtake causality. It’s a bitter lesson, but one essential to the conduct of reason. To pick up on the point Mark made about data and what data to gather. I would view road runner and W.E. 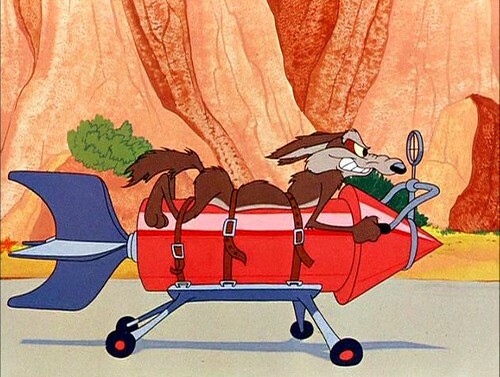 Coyote as a pretty typical example of a comedy double act. Some of the themes seem to me suggestive of American culture of the 40's and 50's, science, mass produced goods etc. I would not view them as the interesting parts they are the hooks to give the repetition within the relationship local context. Which is one of the oldest tricks in the book. Its the dynamics of the double act and to what extent they repeat that strikes me as the interesting bit. But perhaps I am wrong or reading things incorrectly.
. . . the point Mark made about data and what data to gather . . . I don't catch the reference. But in this case, I do think that the 'sciency'framing is crucial to these cartoons. They're of a type that is built on gags, but most gags don't have the level of 'craft' that Coyote's do. & the relationship between the two of them is pretty minimal. Ah, I remember. You're referring to Changizi's article. I'd forgotten I'd linked to it. The question of just what to notice in a cartoon is, of course, important. I'm tempted to say "everything." But I don't quite mean it. In the case of the RR series, what's distinctive about it? And why did Chuck Jones talk about the "disciplines" (his word) they followed in making them? I would not be interested in what is distinctive about it. Its what repeats. They look like stock figures from slapstick. Ive acted and cut my comedy teeth in the wakefeild cycle. Humour does not seem that removed or different if you strip it down to the basic interaction between the two that is built on a series of gags. One avoids the pratfall one does not. I would see that as the data that is interesting in this. But I have a bias towards traditional theatrical craft skills its how I was trained. Well, yes, what interests me about the series is what repeats from cartoon to cartoon. And much of that (e.g. the pseudo-Latin designations at the beginning) is what distinguishes this series from other 7-minute cartoons of the era.